Simplicity. This dish is the embodiment of it. 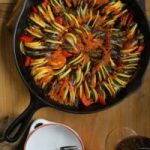 The four components – sliced vegetables, blended sauce, a cast iron skillet, and the oven – create a finished meal that looks like a professional made it. And who’s to say you’re not a professional, right? 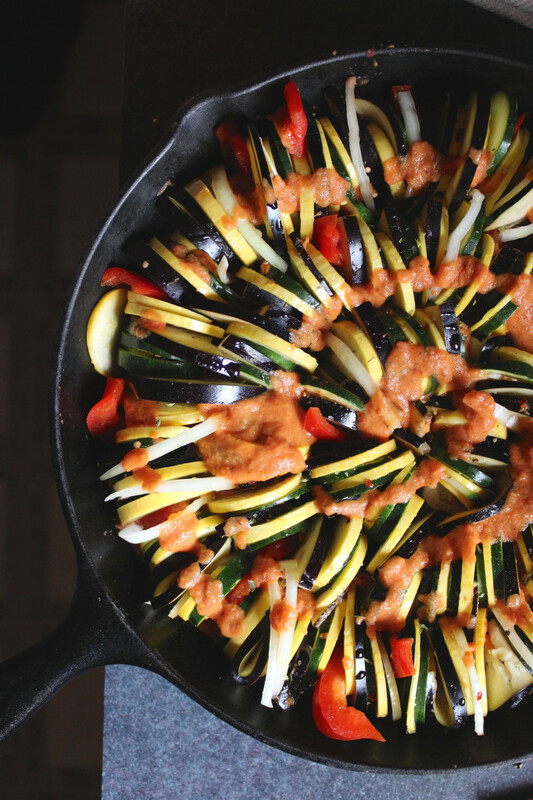 Every time we make ratatouille, the most amazing phenomenon occurs. So amazing, in fact, that it’s probably my favorite part about making the dish. About halfway through the cooking time, the entire apartment – or house, or shoebox, or basement, or wherever we happen to be living at the moment – overflows with the comforting aromas of this dish. It’s indescribable, really. All I can say is that I wish that I could bottle this scent, or maybe make it into a candle, and give it to people at Christmas. As the squash cooks down, it turns sweet and soft. Meanwhile, the red pepper, tomato, garlic, and onion melt together, mixing with the herbs and becoming the sauce. Stubborn ol’ eggplant takes a little longer to cook, but that’s just more time for the rest of the flavors to get to know each other. And all of it happens right there in your cast iron skillet. 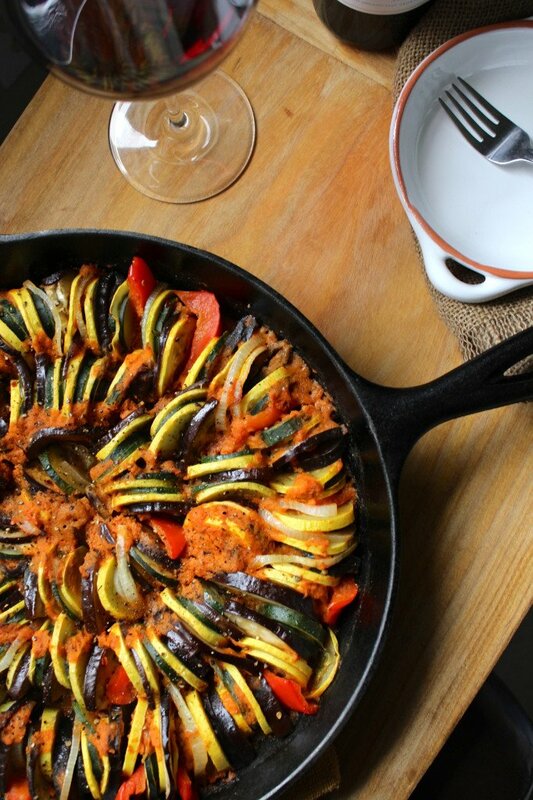 When we made ratatouille for the first time, we were still living in Brooklyn in an apartment building. To this day, I’m surprised that we didn’t have 40 of our neighbors lined up down the hall, knocking on our door to ask for the recipe. Then again, they were probably too busy dragging their laundry back-and-forth to the corner laundromat or waiting for the next 4 train to arrive. I’m not ashamed to admit it: the animated movie was what inspired us to make this dish for the first time last fall. [Yes, last fall. Clearly, this recipe has been a long time in the making.] BUT – Lots of experimenting and lots of perfecting went into this dish. 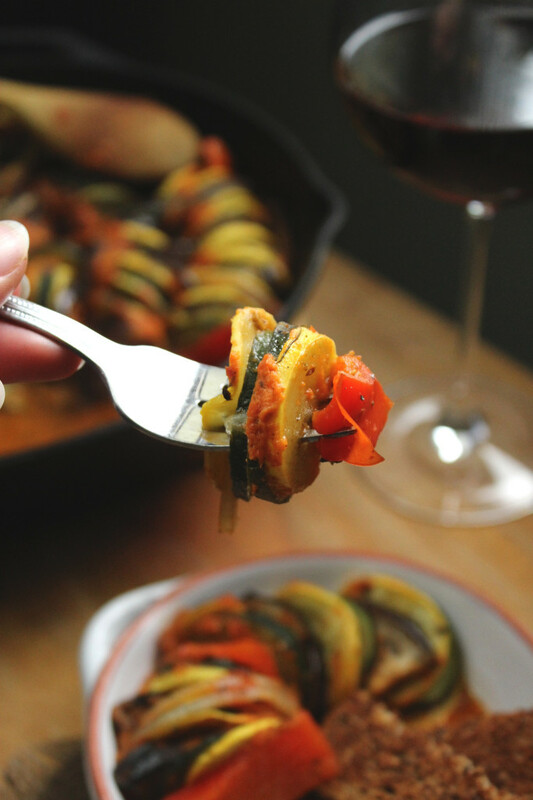 And that’s because we wanted to take the things that we loved most about ratatouille and make them even better, for you, of course! But, back to Brooklyn again, the mind-blowing ratatouille scent floated out of our windows, into the courtyard and into the hallways of our building. 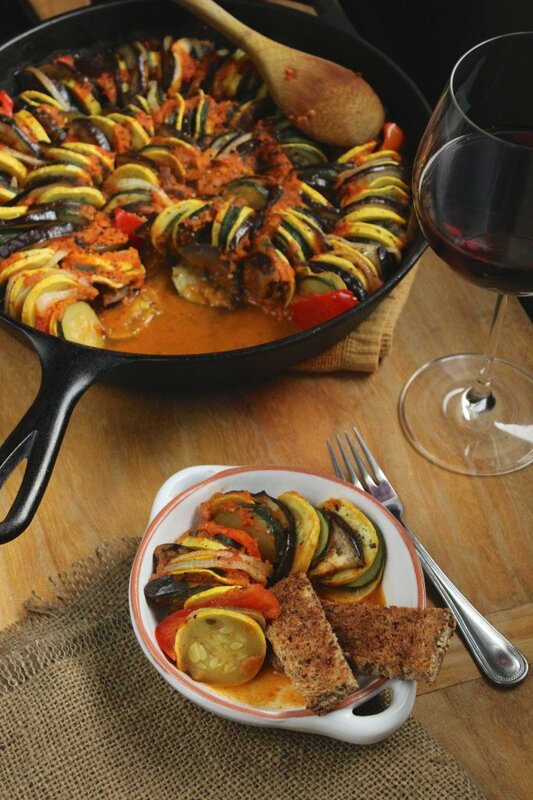 I am certain that NO other dish smells as good as ratatouille does; not even pizza or pasta or chocolate chip cookies. There’s no way I can describe it with words, you’ll just have to wait until you make it for yourself. It’s hard to believe that this was considered a peasant’s meal in the “olden days” in France. Squash, zucchini, bell peppers, tomatoes, eggplant, garlic, and onion grew in abundance in small gardens. Naturally, farm families made the best of what they had. Hence, ratatouille. Little did all the rich folks know, while they thought they were living it up with their lamb chops, paté, and champagne – poor people were enjoying one of the greatest dishes known to man. Bon appétit! 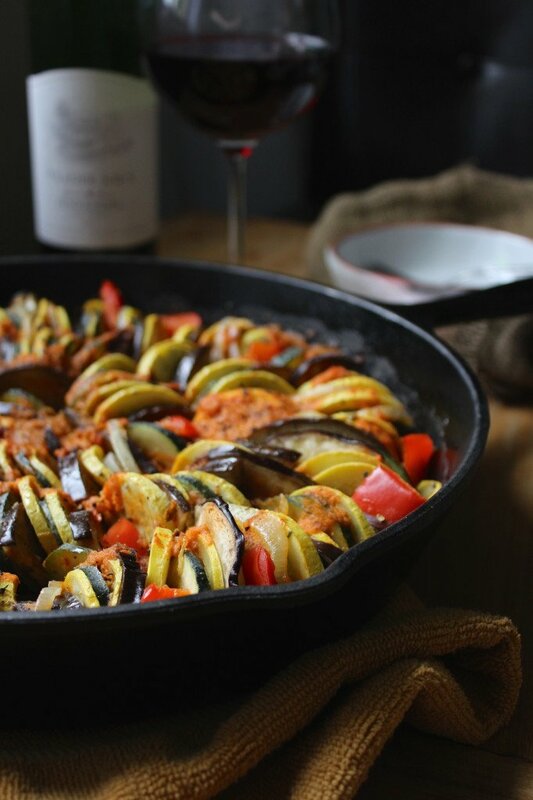 A classic comfort dish, made with squash and eggplant in an herbed red pepper and tomato sauce. Delicious simplicity that cooks in a cast-iron skillet. Preheat the oven to 375º. Add the ingredients for the sauce into a blender and blend until smooth. 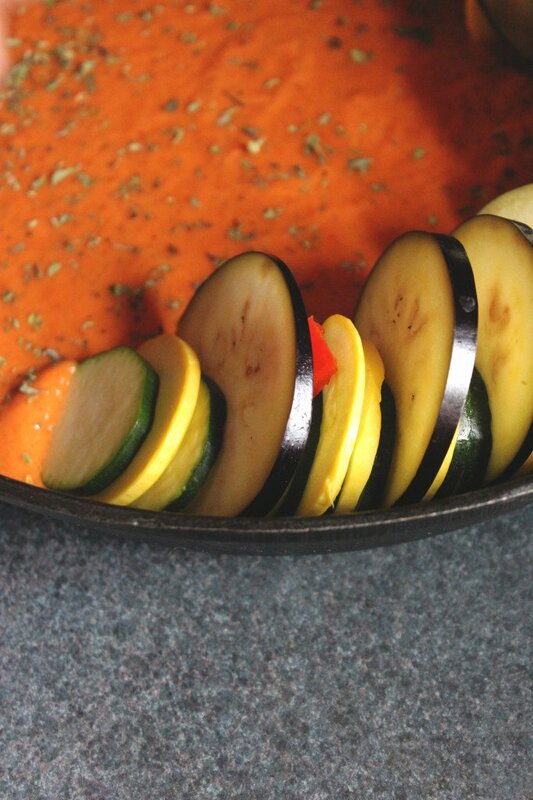 Save 1/4 of the sauce for later and pour the rest into the cast-iron skillet. Spread around to smooth it out. Wash all of the veggies and slice them very thin – less than 1/4″ thick is best. 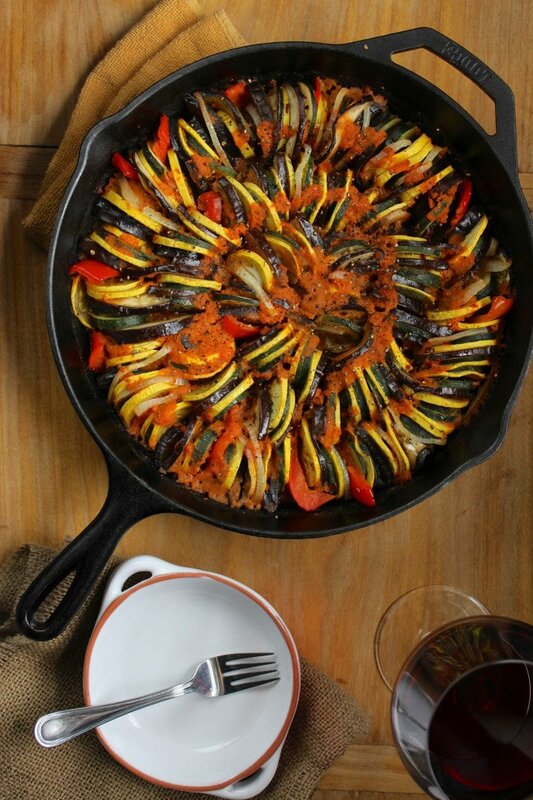 Start arranging the slices in a spiral around the skillet, alternating between veggies. 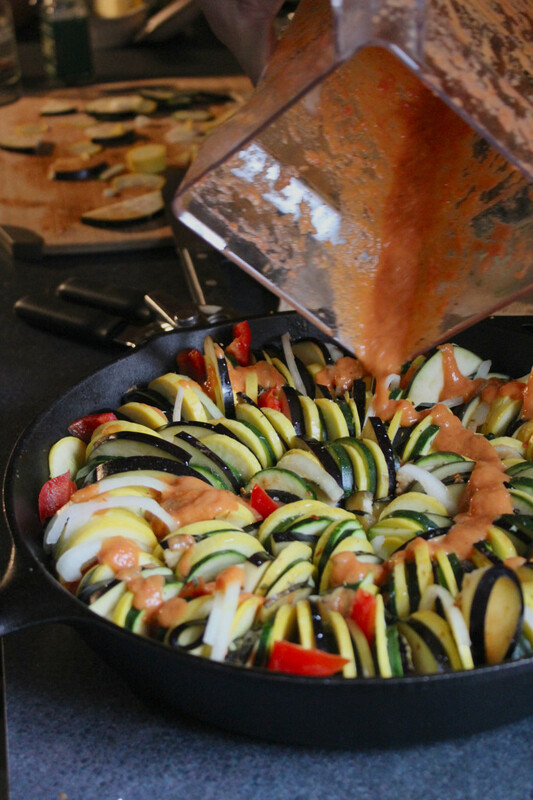 When the skillet is full, drizzle the remaining sauce over the top of the veggies. Lay a piece of parchment over the top of the skillet and bake for 1 hour. **If you do not like spicy food, I recommend decreasing the amount of red chili flakes, or omitting it altogether. For us, the heat is perfect – but we like spicy food! OMG, so good and easy to make. I didn’t have a mandolin so just cut the veggies thinly. Simple sauce, but so delicious! I added very little red pepper flakes because I was making this dish for my kids. My husband asked to make more and I will make it spicier for him. Thank you for a great recipe that I will make again and again! Also, I left out the pepper flakes. Im a spice wimp. When I pulled this out of the oven, it looked stunning, just like the picture. Then I tasted it… and was a little underwhelmed. I took another bite. And then I finished off the pan. I don’t know what I was expecting with my first bite, but I initially felt disappointed… Like it was just another squash dish. And then thought, “but I want another bite.” It was addicting! Definitely will be making this again. It was easier to make then I expected. I used a mandolin at 1/8 in. Also, I used fresh tomatoes instead of canned, thanks to the overabundance in my garden, and probably double the lemon juice. The kids were not fans. Maybe we should’ve watched the movie first. It wasn’t as pretty once it was dished out, and they turned up their noses before even tasting it. Such a shame. Oh well, more for me. I was so disappointed at how spicy it ended up. The kids and I couldn’t even eat it. You should put a warning or something. I’m sorry it was too spicy for you. :( I’ll add a note to the recipe for future reference! Hi, Can you tell us the size of the skillet? 10″, 12″? Also by “small eggplant” do you mean the thin Chinese ones? I found that 3 small squashes and 1.5 eggplants ended up with too much squash. 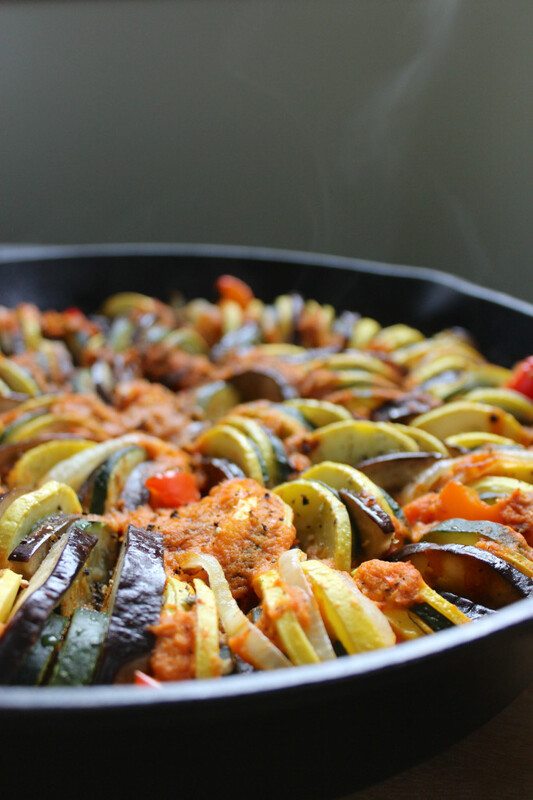 When I used all of the squashes and 2 eggplants, I filled a 10″ skillet and an 8″ skillet. So perhaps the measurements could be refined a bit in the recipe, perhaps adding approximate cups or ounces. And add an approximate size of veggies in terms of lengths and diameters. Thank you. Hi Mari! Sorry for the delay. This was made in a 12″ cast iron. I used a regular eggplant, the traditional variety. But it was on the small side. 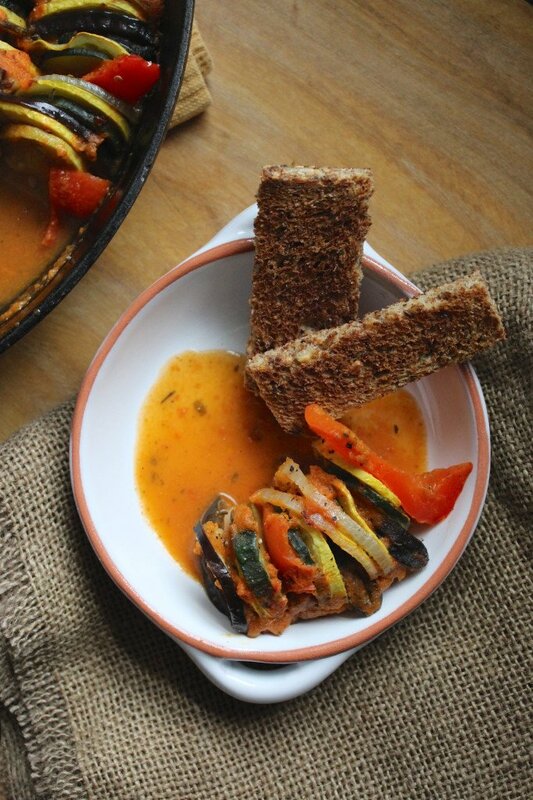 This recipe is an older one – I’ll be revising for clarity ASAP! Thanks for bringing it to my attention. Hello! This recipe looks so amazing, but do you mind if I ask how many servings this recipe yields? Delicious and awesome recipe, but waaaay too spicy for me! My husband liked it, but he has a crazy high tolerance for spice. I can usually tolerate a medium amount at restaurants, but this was hard for me to eat. I will definitely make it again, but use a teaspoon instead of a tablespoon of the red pepper flakes. This was delicious and easy to make. Meow ever, we will use a little less red pepper. It was spicy, spicy, spicy. Thanks for the recipe. We really enjoyed it and will make it again. Sorry it was too spicy for you! I should probably always tone down how much chili flakes I recommend in recipes… I might have an addiction to spice! What is the bread you served with it in the picture? It looks good too! Recipe? Love this recipe. Simple and easy to clean up! Agreed! It’s so easy but tastes so special. Glad you enjoyed! LOVE to hear that! Let’s say it was 99% you, and 1% this recipe. ;) Either way, you rock! What size skillet? Produce Junction has just about everything the recipe calls for.